I’m pretty sure the only thing that could force me to keep my eyes open right now is s’mores. That’s how tired I am. And you know, even s’mores might be too much work for me at the moment. I’m legitimately sitting on the couch, too tired to even drink a glass of wine. That’s how you know it’s bad. I’m almost contemplating turning off the Bachelorette’s Men Tell All that I’m catching up on because my eyes will barely stay open (to be fair, this show is kind of a snooze fest right now, right??). I keep looking at my calendar because I can’t really believe it’s only Tuesday. Tuesday?? Tell me that’s not true! 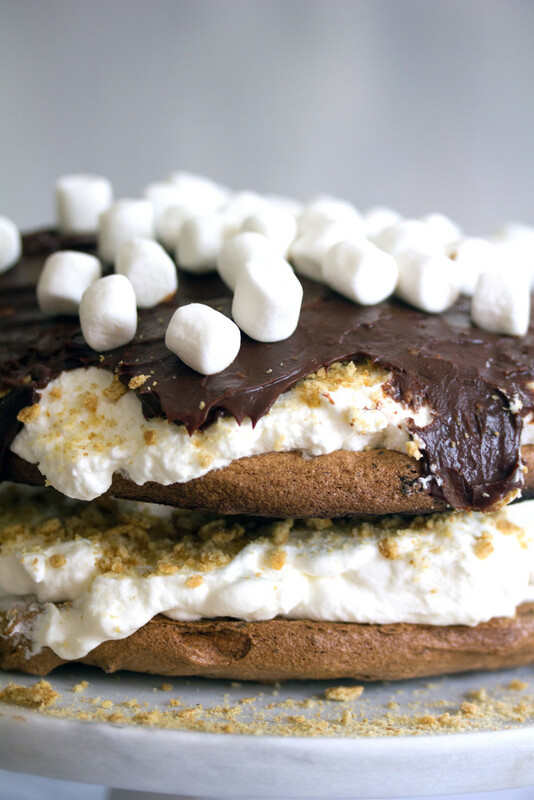 If a day ever called for s’mores, this would be it. But the kind that don’t require any assembling or work. Like a s’mores pavlova. Yup, I’d stay awake for that. Have you noticed that my love for s’mores knows no bounds? I just think it’s the most heavenly dessert combination in the world. Yes, better than strawberries and cream or chocolate chip cookies and ice cold milk or apple pie and vanilla ice cream. S’mores are everything. But pavlova is pretty cool, too. And I’ve been making it like a madwoman lately. You know, the kind of madwoman who does things like make pavlova. I’ve made this chocolate one a few times now and decided I wanted to try something new and fun. 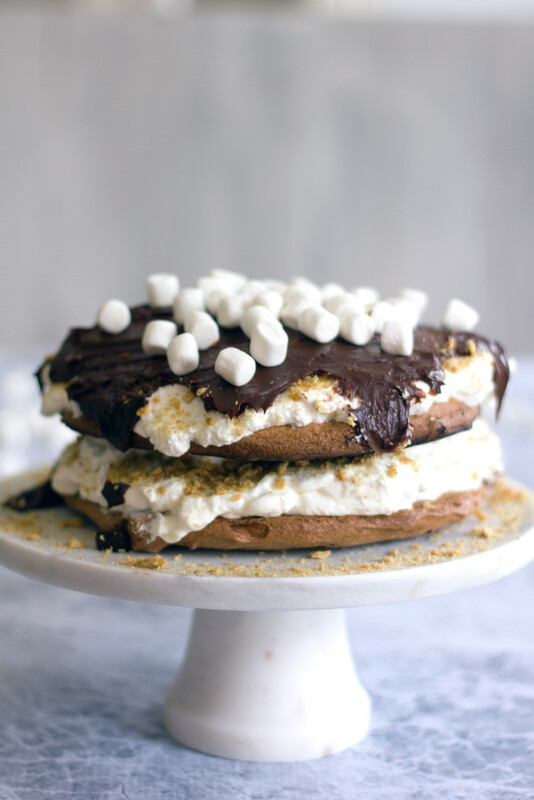 Since s’mores are clearly on my mind a lot, I decided to combine my two loves into a s’mores pavlova. It involves lots of whipped egg whites and chopped chocolate and cocoa. My pavlovas never look very pretty when I’m forming them, but the end result is always A-OK. Cracks in pavlovas are totally allowed! 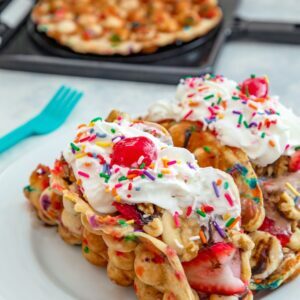 Plus, you’re going to be covering the entire thing in a ton of whipped cream, so nobody will even see the imperfections. Also, you’ll be mixing lots of mini marshmallows into the whipped cream. Which basically makes my dreams come true. Once you slather one layer of pavlova with the marshmallow whipped cream, you’ll crumble graham crackers on top. And then do the same thing with the second layer. This was my first layer pavlova. Even though the pavlova was a chocolate pavlova and made with chocolate and cocoa, I still didn’t think that was enough chocolate. So, I made a quick ganache. Seriously, ganache is really quick and easy. Just spread it all on top and add more marshmallows. As many as you want. Hello, everything I love about s’mores in pavlova form. Or is it everything I love about pavlova in s’mores form? All I know is that once it’s made, it’s made and it lasts a few days in the fridge. No assembly required. No campfire required, either. I recommend cutting yourself a gigantic slice. And enjoying every single second of it. This really didn’t do anything to put a stop to my pavlova obsession. Not that that’s really a bad thing. Especially if you ask my husband who happens to reap many of the benefits. If you haven’t yet made a pavlova or meringue creation, I urge you to do it ASAP. Like now! Ugh, I forgot it’s only Tuesday, but there’s absolutely nothing wrong with a Wednesday night pavlova. One of the best parts is that pavlovas aren’t made in campfires. And they’re best enjoyed on couches. I hear they go especially well with trashy reality television. Not that I’d know anything about that. I did hear a birdy say that once the Bachelorette ends, Bachelor in Paradise begins the next week. But I’m totally not interested in that. I’m just sitting here eating my pavlova, minding my own business. This is totally worth staying up late for. I even kind of want to stay up and just think about it. Is that weird? Probably. Do I care? Nope. What’s your favorite s’mores creation? 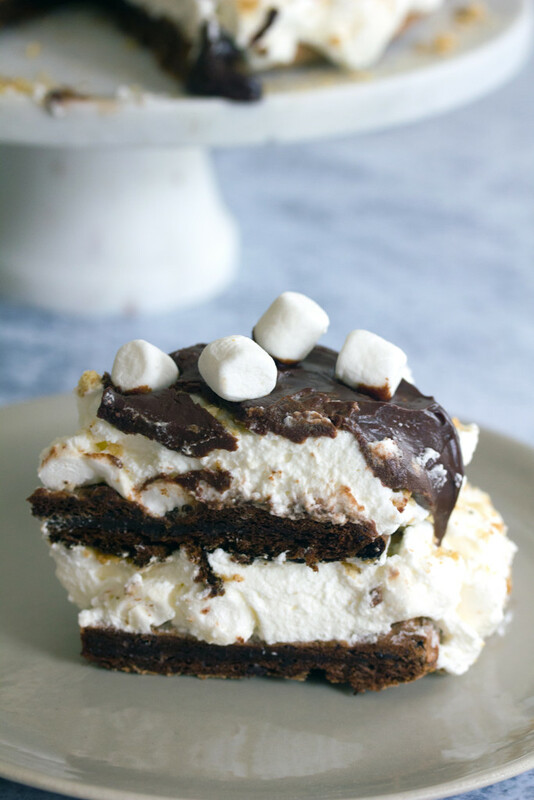 All the classic components of s'mores come together to form a decadent multi-layer pavlova. It tastes just like a cake and it's incredibly easy to put together. No campfire required. 3/4 C mini marshmallows plus more for topping. On two pieces of parchment paper, draw circles 9 inches in diameter and place parchment paper upside-down on baking sheets. 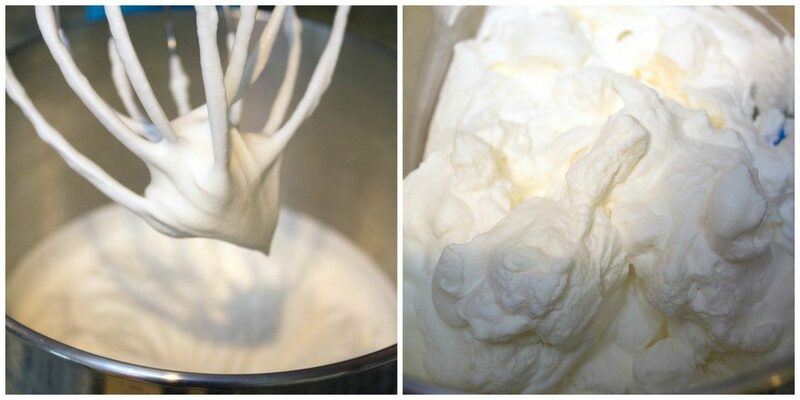 In a stand mixer or in a large bowl with hand mixer, beat the egg whites until soft peaks begin to form. Beat in sugar slowly until egg whites turn shiny and stiff. Fold chopped dark chocolate and cocoa gently into the egg whites until evenly dispersed. Dab a small amount of meringue onto each corner of the parchment paper in order to secure papers to the pans. 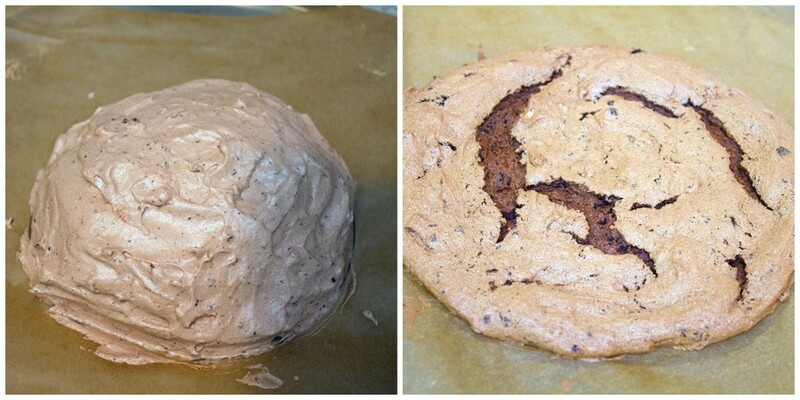 Divide the meringue into two equal portions and form mounds within both of the circles on the parchment paper. Smooth sides and tops of meringue mounds with a spatula. Put meringue in the oven at 350 degrees and then immediately turn oven temperature down to 300 degrees. Bake for about one hour, until meringues are crisp on top, but squishy underneath. Turn oven off and open door a bit to let meringues cool completely. Once cooled, invert one meringue onto a cake plate and cover in marshmallow whipped cream. Sprinkle graham cracker crumbs on top. 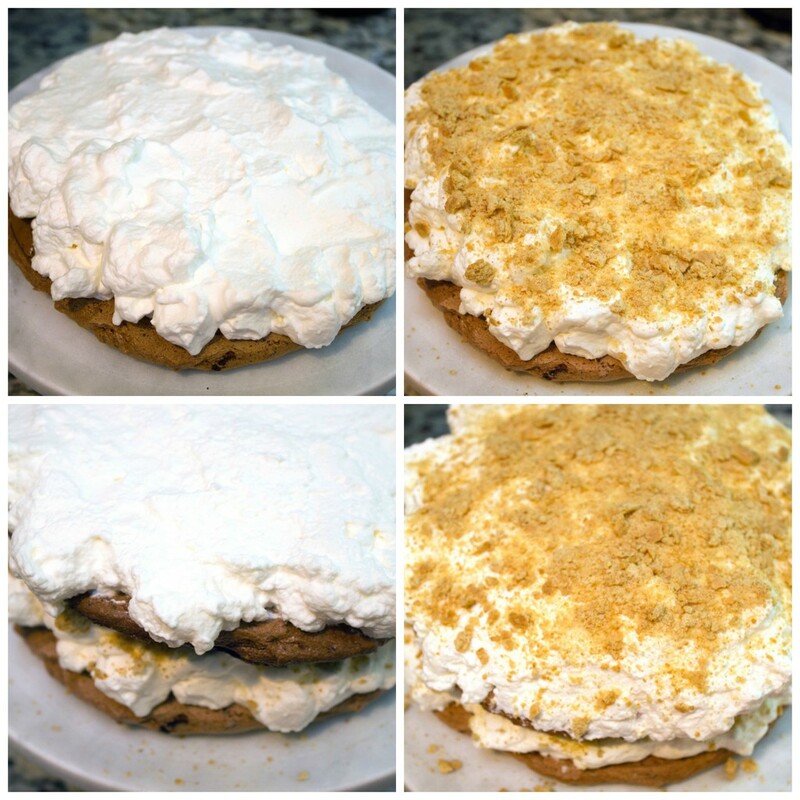 Invert second meringue on over whipped cream and graham crackers and top with more whipped cream and graham cracker crumbs. Pour chocolate ganache over the whipped cream and let drizzle down the sides. Top with additional mini marshmallows. 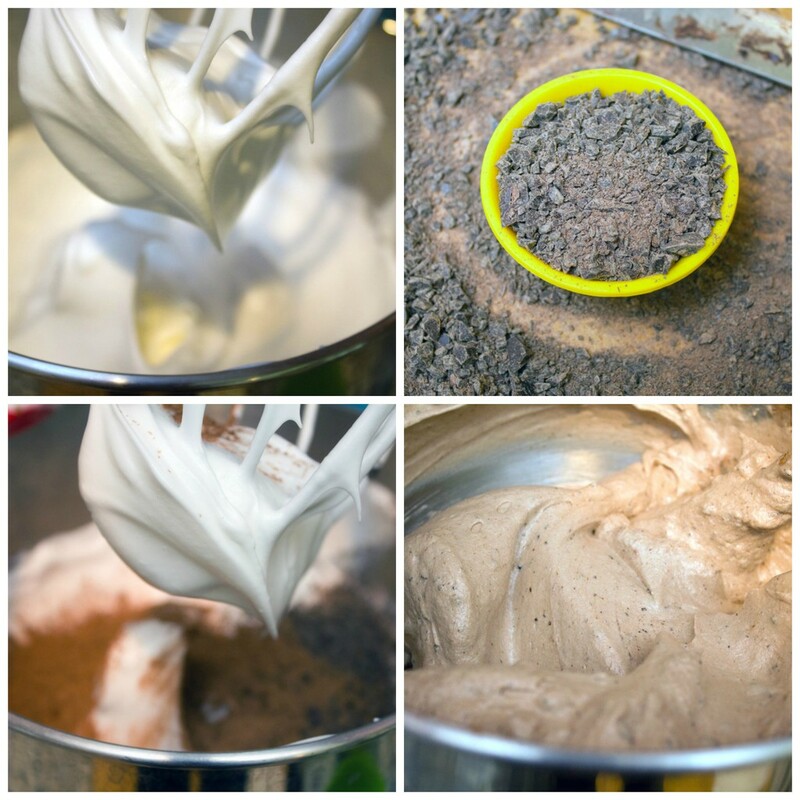 In a stand mixer or in a large bowl with a hand mixer, beat cream until soft peaks form. Add sugar and vanilla to cream and continue to beat until soft peaks form once again. Keep chilled until ready to use. 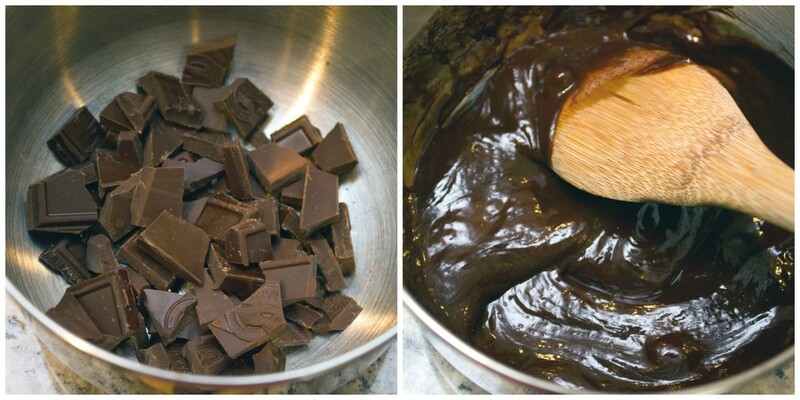 Place chopped dark chocolate in a medium bowl. Heat cream in a small saucepan over medium-low heat. When cream is very hot (but not boiling), pour over chocolate. Let sit for one minute and then stir gently until smooth. 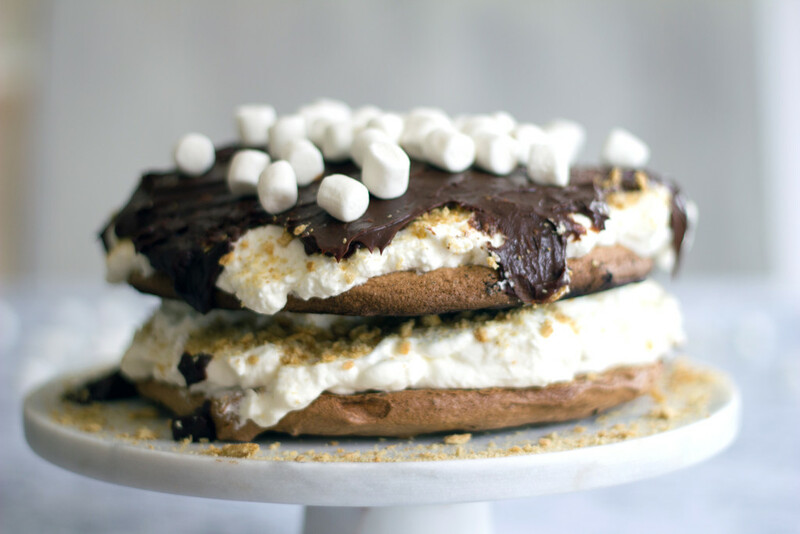 22 Responses to "S’mores Pavlova"
OK this is awesome! Such a neat, creative idea!! You are my hero. 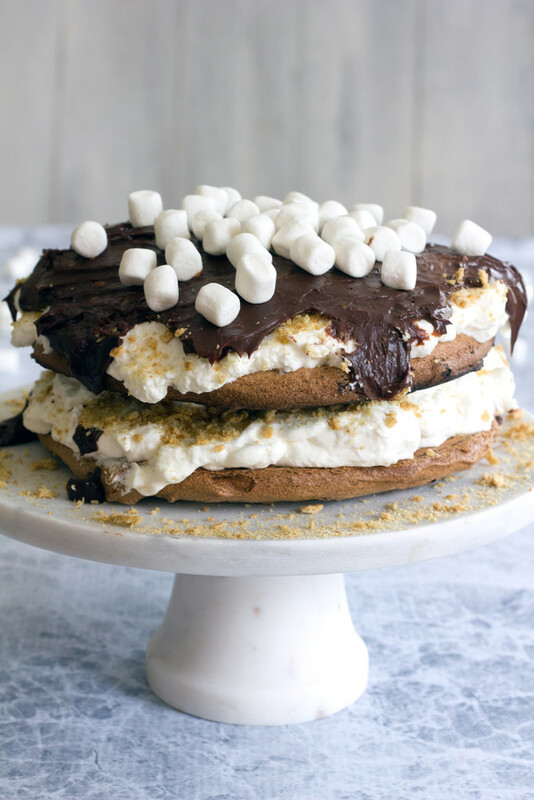 I’ve never even thought of doing a s’mores pavlova, which makes you inventive and creative and awesome! Oh wow, what a gorgeous dessert! I’m loving the pretty layers on here. And that chocolate, yum! Sounds amazing! I’ve never had s’mores and I think it’s time I rectify that! 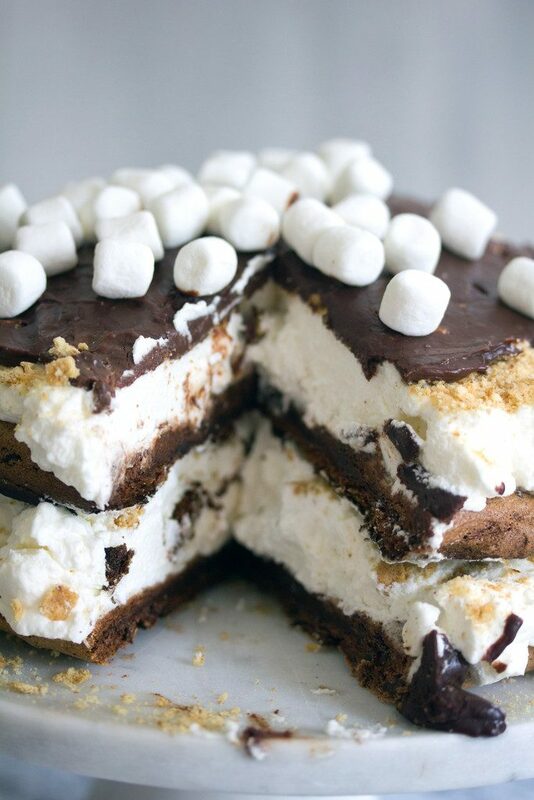 Oh my goodness, this is the ultimate s’mores dessert! Love this idea! This pavlova looks incredible!!! 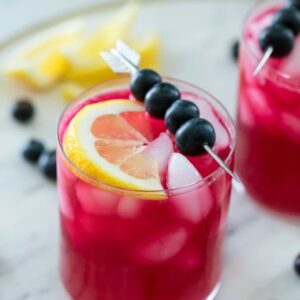 oh wow now this is different and beautiful and delicious! 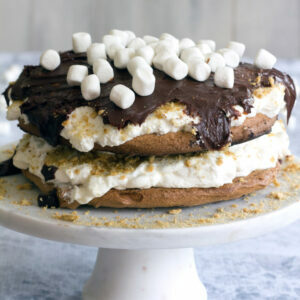 Such an amazing idea to combine crunchy sweet chocolate meringue with whipped cream, marshmallows and chocolate ganache, I am honestly in love. So so so in love! what a great dessert! so creative. it looks amazing! 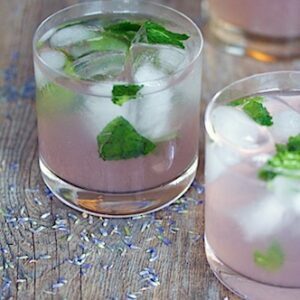 Oh my gosh, YUM!! I’ve been wanting to make pavlova for awhile now but haven’t been brave enough to do it. Maybe now I will be! Now this is exactly my kind of pavola! I don’t think I have seen anything better, wow! I hope you catch up on your sleep too. What a fun cake! Who needs a campfire when you can make this! Drooling at the thought of this! I bet that creamy chocolate and whipped cream are so good with the crunchy meringue. I’ve never made a pavlova, so I need to change that! I love that you watch the Bachelorette! Let’s watch the finale together while we eat pavlova. This looks so freaking amazing! I haven’t had s’mores once this summer… major fail on my part. 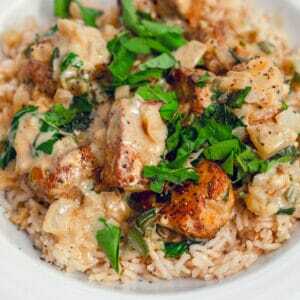 I would love to be eating this on my couch right now! I AM going camping, but there is a fire ban in BC, so I can’t make smores! Boo. At least I can make something like this! Ok yes I want to eat this entire cake! AAAAMMAZING!! I’ve actually never made/eaten a pavlova. That’s pretty bad, isn’t it? This is totally WOW-worthy. It’s a masterpiece! Wowser! I’m loving this one!! !